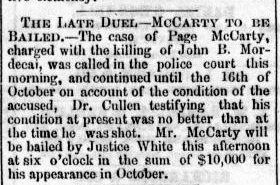 While researching the Haxalls buried in Hollywood Cemetery I stumbled upon the story of the Mordecai-McCarty duel of 1873, one of Richmond’s last (if not *the* final) fatal duel, ignited by an unfavorable poem published by a jilted lover. At the center of the conflict was Mary Triplett, who would later marry into the Haxall family, but prior to that was well-known in Richmond as one of the loveliest young women in the higher social circles. At one time she was engaged to Page McCarty, but after breaking off the engagement she severed all ties to him. According to an account written by William Royall, who would also play a role in the duel, Page and Mary were thrown together in a dance at the Richmond German in February 1873. Mary left her partner on the dance floor prematurely, an act which embarrassed and angered Page to the point of writing a poem to be published in the Enquirer the next day. When I first read that the poem was of a risqué nature, I expected more than this, but being that it was 1873, I imagine it took much less to offend a lady’s honor than it does today. Although those lips be false. When those dear lips were true. John B. Mordecai, who was allegedly one of Mary’s suitors at the time, read the poem and in a rage said that he would have to kill McCarty to defend his lady’s good name. The two planned previous duels but were talked out of them by friends hoping to keep the peace. The affair remained on the lips of local gossips, which only added fuel to the fire. McCarty and Mordecai even ended up in a barroom brawl over the poem before the final duel was scheduled. On May 9 the two men, their respective associates, and several physicians met around 6 p.m. near Oakwood Cemetery, both of the participants armed with Colt’s Army Revolvers and a distinct set of rules. On the first run, both men missed each other and decided to try again. This time both men’s bullets hit the targets. Mordecai was shot in the abdomen and McCarty in the hip. McCarty would survive but Mordecai died four days later. 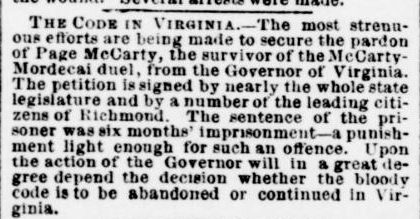 The surviving participants of the duel were arrested and later McCarty was found guilty of manslaughter. He was fined $500 and due to lasting complications from his wounds, he was pardoned from serving his six months in prison. Newspapers in various states ran stories about the duel, some suggesting that there was more to McCarty’s poem than I was able to find. Sensationalism in the media is nothing new, I suppose. This is by no means an exhaustive collection of blurbs. Many of what I found were miscellaneous news items to the effect that Mordecai had died, that the trial had been scheduled, etc.